CAIRO – Masked assailants attacked a bus carrying Coptic Orthodox Christians on the way to St. Samuel Monastery in southern Egypt, killing at least 26 people, many of them children, according to the country’s Interior Ministry. “It is too early to say who is behind it, but certainly terrorists, and the security forces are now scanning the area” to find the culprits, Tarek Attia, Interior Ministry official, told Sky News Arabia, an Arabic-language television station, May 26. He said three cars carrying the masked gunmen had attacked the bus at roughly 10:30 a.m. in the southern governorate of Minya, a traditional stronghold of Egypt’s Christian community, which accounts for a tiny percent of the country’s mostly Sunni Muslim population. The attack marked the latest in a series of deadly attacks on Coptic Christians, whose church was founded by St. Mark the Apostle in the first century, and whose community represents the largest of the Middle East’s Christian minorities. On April 9, two suicide bombers attacked St. George’s Cathedral in Egypt’s northern city of Tanta and St. Mark’s Cathedral in the coastal city of Alexandria. Those attacks killed and maimed dozens in what was the deadliest attack against Christians in Egypt’s recent history. A nationwide state of emergency has been in place since. In a widely publicized visit to Egypt soon after the April attacks, Pope Francis addressed the terrorist violence carried out in the name of a fundamentalist reading of Islam. Pope Francis frequently has said there are more Christians being martyred today than during the persecutions of the church in the early centuries of Christianity. And, using the term “ecumenism of blood,” he has noted how Christians divided into churches and denominations are united in mourning for their members killed not because they are Orthodox or Catholic, but simply because they are Christian. “We hope for the necessary procedures to prevent these kinds of attacks, which degrade the image of Egypt and cause so much suffering to Egyptians,” the statement said. 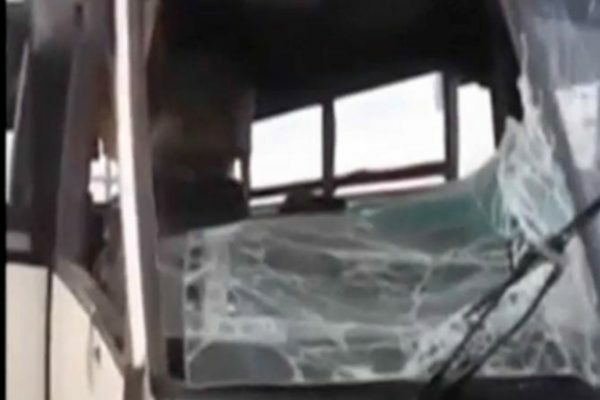 An Interior Ministry statement said unknown assailants driving three four-wheel-drive vehicles had attacked by “randomly shooting” the bus carrying the Copts, and that an official count of the final toll was underway. Local media showed grainy images of bloody bodies strewn on sandy ground, indicating many of the slain had fled the bus trying to escape the assailants’ bullets. Later, the media showed images of the wounded being taken to hospitals and reported that Egyptian President Abdel-Fattah el-Sissi was calling for an emergency security meeting to address the attack. El-Sissi had instructed authorities to take all necessary measures to attend to the injured and arrest the assailants, the local media reported.